After a week of not feeling like doing anything, not even to get crafty I woke Friday morning ready to give my mojo a jump start. Playing along with the current Runway inspired Challenge I created this card. I picked up on the colours making yellow my focal point. I also made a note to myself that I need to get an origami stamp set! 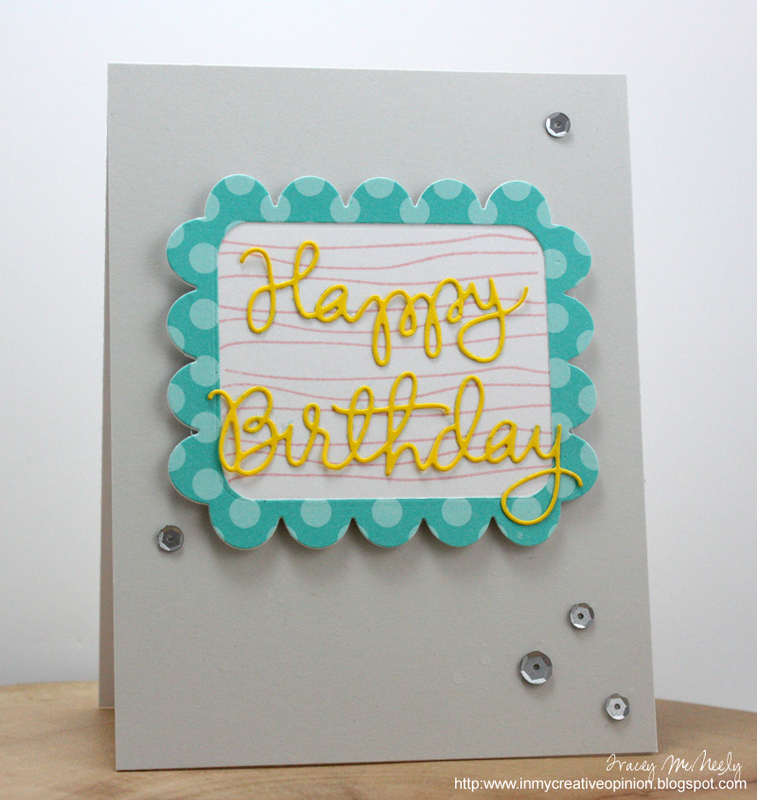 On a grey card base I created a frame using Hawaiian Shores patterned paper, stamped the inside of the frame with some graphic lines using pink and topped it with a bright yellow Happy Birthday die cut. Of course I had to finish it off with a few grey sequins! I hope that you have a wonderful weekend, the weather forecast looks great here. Just 4 more sleeps until hubby comes home! Gorgeous take on the inspiration photo. Love the soft squiggly lines in the background. I hope you have a relaxing weekend ahead. What a fun card. I love the sequins and that awesome die cut sentiment. Love the squiggly lines and the polka dot frame! Cute card. Hope the next four night pass quickly for you! Another winner, right here! Love how you've interpreted the inspiration! Fabulous card, and so happy to hear that your mojo is back. I love the little lines on your focal point, and am amazed to see that they are from a set I have, and I just completely overlooked that particular stamp. Super cute, Tracey! I LOVE the Happy Birthday dies!! Perfect take! Love the sentiment die...and I hope you are feeling better! Tracey...this is just too darn cute! I really love your take on this challenge, such a fun way to say Happy Birthday! Cute and fun all in one! Great birthday card! Oh my! This is darling! I love it! Sweet card! Love the die cut sentiment and grey sequins! This is lovely, Tracey! Great take on the photo! Thanks for joining us at the Runway Inspired Challenge! Based on this lovely gem of a card, I think your mojo is back in finely-tuned working order! Love this, Tracey!! I love your whimsical take on the inspiration photo, Tracey! 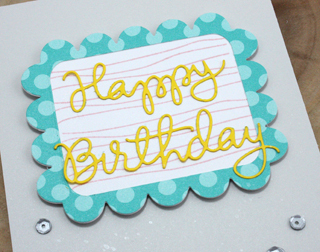 The color combo is spot on, and I love how you framed out your sentiment...looks like the top of a birthday cake! I'm loving all those fun polka dots, too! On that note, I think your mojo is going strong! This is a fun take on the challenge :) love it ! Adorable..I really love the color of your card base, and the way the other elements just pop! Thanks so much for joining us on the Runway!